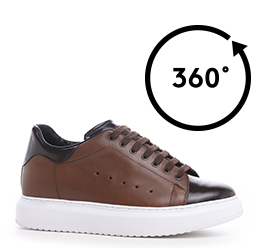 Handmade elevator sneakers with upper in brown full grain leather and details in semi-shiny calfskin. The comfortable white sole is made of ultralight rubber. A stylish and casual footwear able to increase height by 2.6 inches (6.5 cm) in total secrecy.